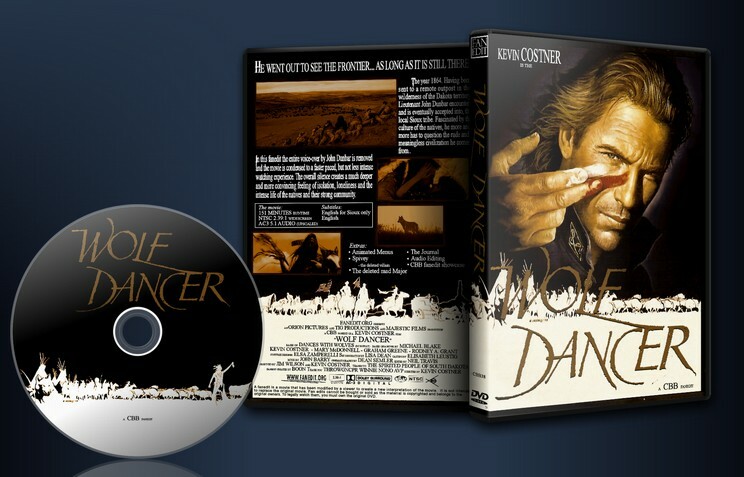 To tell Dances With Wolves in a new, faster paced, plot condensed version that gets rid of exaggerations, focuses on John Dunbar and his journey from being a soldier to joining a Sioux tribe, and to let the audience experience the turn for themselves without the voice-overs that take away any thinking of their own. I am a true fan of the original and this has not changed. My version is not meant to improve the original, but to create a different version that can be watched easier than the full 4h and also cause a different atmosphere. Spivey the deleted villain (5:58): is a deleted scenes feature about the most over-the-top villain of the movie. The journal (14:50) a slide-show that contains all 24 journal entries spoken by Kevin Costner. The deleted mad major (5:47) is a commented feature about the incredible insanity of this guy. 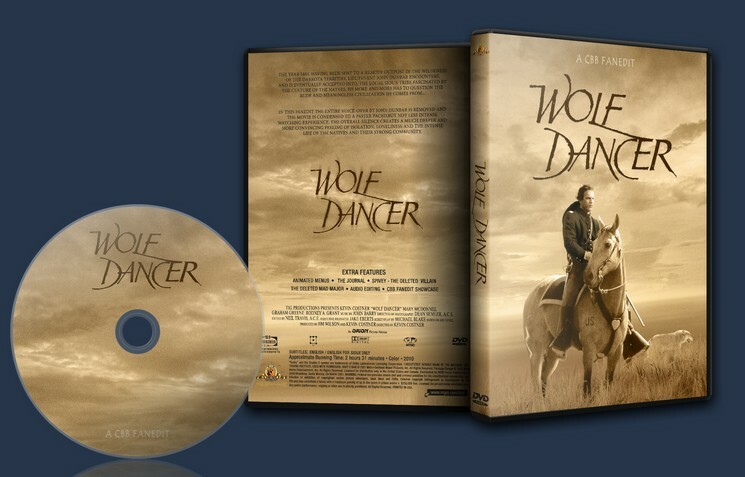 Audio editing (5:46) an extended look at the audio work that went into the creation of Wolf Dancer. CBB overview information about all 38 CBB fanedits. After watching Avatar I was reminded on this wonderful movie and realized that I hardly ever watch it, because it is just too long. I thought about fanediting it, condensing it and maybe remove some of the weird parts that always bugged me a bit. When I watched the movie again, I realized that these voice-overs are a bit annoying, especially because they happen all the time and leave the audience no option to feel or see anything the way they want to. So I decided to get rid of them. I also realized that my original DVD was truly bad quality and purchased the bluray to work from a great quality source. It truly shows. This fanedit looks by far better than the original DVD. I asked my friend, ThrowgnCpr several times if he would think this or that would work – and his input has helped me (and this fanedit) a lot. It was for example his help that led to the deletion of the flashback scene of “Stands With A Fist”. The input from Mollo on the forum was also great and helped shape it some more (although I did not do anything about Mary McDonnell and her Bonnie Tyler look – sorry, dude). But like me he felt that the mad major Fambrough needed the full editing treatment to be bearable. He actually suggested to skip him entirely, which I did not do for plot reasons, to give John Dunbar a true soldier beginning and the audience some needed moments to get to know the character and his intention for his voyage. “I am here on my own request to see the frontier before it’s gone.” is a key sentence to me that must be in the movie. My initial goal of 2h was not possible without sacrificing too much important plot and atmosphere, so the final runtime is around 2h30min. The plot focuses a lot more on John Dunbar. I removed many scenes with “cute Indian” humor, because they did not add to the intensity and distracted from the depth. My take is more serious, faster paced and deeper than the original. The questions always were: is this scene needed? What does it do for the progress of the movie? Is it important for the atmosphere? The removal of the voice-overs and fully recreating the audio of these scenes was a huge undertaking. It took hours for a few seconds. Overall I used more than 150 different sound effects. Very interesting edit. 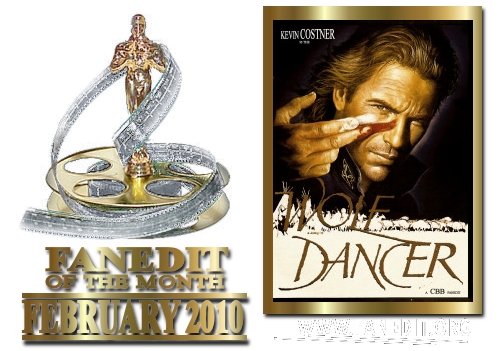 I am a big fan of Dances With Wolves. I remember the first time i seen this movie was when i bought the VHS from McDonald's. Yep McDonald's was doing some kind of special and had like 3 movies they were selling for a limited time. Crazy. Now i own the 4 hour version. I really like this edit. I can't say that it will be my go to version, but i like the alternate take. I do think the movie is improved by taking out the voice overs. And most of the scenes taken out don't hurt the movie too much. While i do like the odd suicide attempt and the mad major, neither are required and possibly out of place anyway. And i'm glad you cut Spivey. I only have a few minor items to discuss. 1. At first i found it kind of odd that you don't know why the Sioux kids are doing the random drive by at the soldier fort. It almost seemed out of place without seeing the scene cut out explaining it. I guess it didn't need explaining. And i do agree that not seeing the Sioux camp for a while adds more mystery to it. So i'm up in air on that one. I like and hate it. 2. I kind of liked the flashback scene with the Pawnee. I do agree it's not necessary but i liked it. Cool either way. 3. I did notice something minor. I'll have to watch it again just to make 100% sure. But without the voice over it is not explained why he calls the wolf 2 socks in the scene where he yells at the wolf to go home. Unless i missed something he didn't refer to the wolf by name anytime before this. So your wondering why he named it 2 socks. But maybe once again it didn't need to be explained. Even with those small gripes i can still see myself watching this version from time to time to watch an alternate take on this classic. Great job. First review here…so what to say? Great concept, good editing choices and superb editing skills at work here. 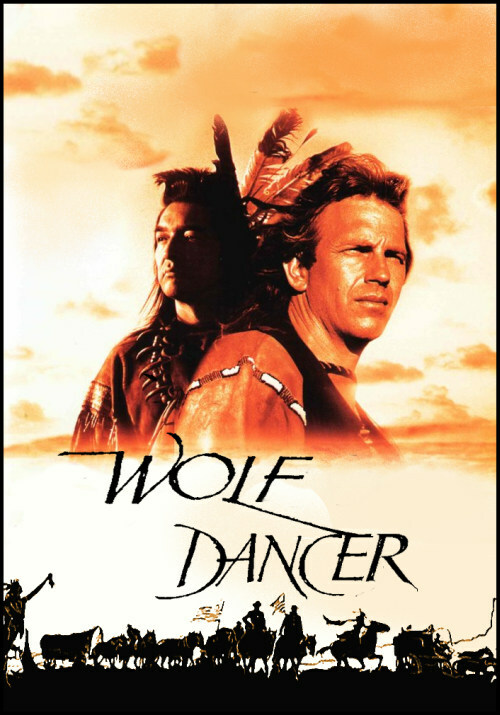 I do not believe that I will ever watch the original Dances with Wolves again. You may say that the intention isn’t to improve the original, but with this one I strongly feel that this is the case. Some comments about the cut list…”removed all voice overs”, is really what stands out the most as the major change. And it really really works. The added emotional depth for the movie is great, just by saying less! Keeping the focus on Dunbar’s experience also helps us (me) to connect emotionally. The added arrival scene (repeat shot from first approaching the Lakota) was perhaps needed but I actually noticed it when watching (that it was a repeat). It might be possible that I was being very alert, looking for changes and how it was presented, and that a viewer in general wouldn’t catch this one. “cut entire journal mentioning in the soldier camp and later on”. Not entirely sure about this one, as the journal is his reason for going back. It makes movie sense for them to be talking about it, and I wondered later on what had become of it, since it was so important to him. But I’m sure you had good reasons for leaving it out. “removed â€œStands With A Fistâ€™sâ€ flashback”. At first I was a little confused here, but thinking about it I agree that this version works a lot better, and we don’t see flashbacks in any other part of the movie. As I said earlier, lots of other good editing choices. I was also struck how much better this story is constructed and played out than the one in Avatar. Your editing has highlighted the best parts of that story. Thank you. Dances with Wolves in its original form is a perpetuation of the long-standing myth of the American west. It embodies overt revisionism and romanticism. At its heart, it reeks of fantasy and sentimentality. It also continues the insidious myth popularized by western screenwriter Frank S. Nugent, that white women once captured by the American Indian inevitably go mad. The problems I had with the original film mainly focused on four issues. The opening American Civil War sequence, the Mad Major scene, the vaudeville villainy of the American troopers and Mary McDonnellâ€™s poor acting and Bonnie Tyler hair. 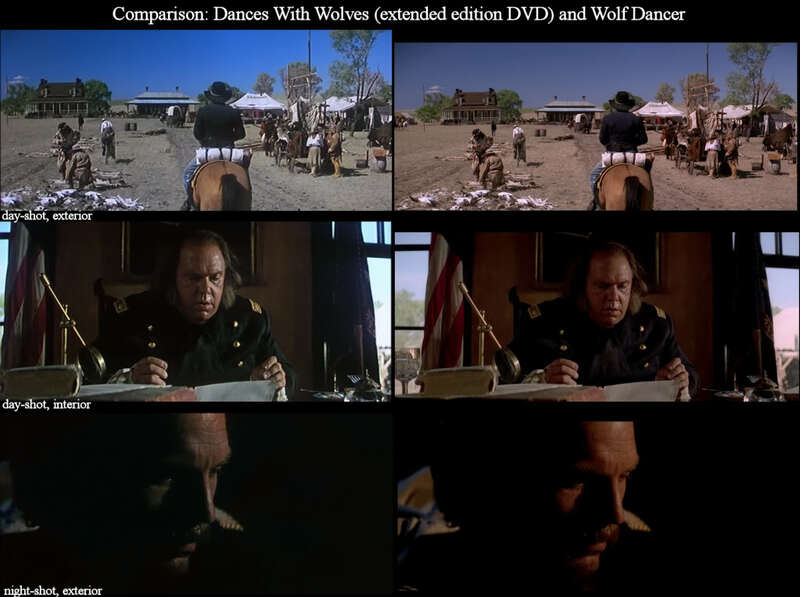 Boon’s idea that Dances With Wolves could do with a FanEdit is a solid one and I eagerly anticipated its release. The opening titles of Wolf Dancer are superbly done and the introduction of our hero reminds me of westerns of a bygone era. This also removes the American Civil War sequence, which in my opinion is a major improvement. 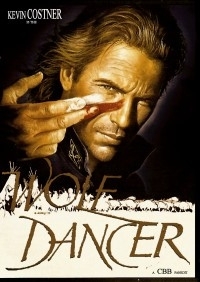 In Dance With Wolves, there are constant references to Costner as a benign Christ-like figure and the more of those that are removed the better in my opinion. So far great stuff but this beautiful title sequence leads us to the â€œMad Majorâ€ scene. Boon has radically culled this scene of its nuttiness but in doing so has altered the pacing, which now appears somewhat rushed and abridged. The line “I want to see the frontier before it is gone” needs a reaction shot from the Major or a pause before he rapidly suggests the wagon master. Also Costner’s salute but mainly his reaction is at odds with the new content of the FanEdited scene. From here the FanEdit settles into a confident stride with solid narrative flow and seamless editing. I began to become engaged in the film rather than being aware that it is a FanEdit. This feeling of completeness continues right until the end credits and I was very satisfied with the over-all result. The problems that remain are inherent in the original, as mentioned above but these cannot affect the consistent improvement Boon has achieved with this FanEdit. The removal of the narration is perfectly done and the sound editing is faultless. I would have added a bit more of a thump when the young brave is pulled off his horse, maybe even the sound of bones breaking but this is subjective. The enormous amount of work that has been with the sound design of this FanEdit is really excellent and in my opinion sets a new standard in CBB productions. So in conclusion this is a healthy improvement over the original apart for the minor issues with the â€œMad Majorâ€ scene. Wolf Dancer is now my preferred version. Not perfect but damn near close. The picture quality is very good. I have not compared it with my PAL Special Edition but it is really crisp and bright. I struggled as to how I wanted to word my comments of this FE. I have been a huge fan of the book since it’s original release (well before I knew there was going to be a movie). I guess it is also important to mention that I am half-Sioux (my mother’s side of the fmaily are almost all exclusively full Sioux). So needless to say, I have always had a soft spot for this movie (in the book, the Native Americans are Commanche, not Sioux). For me, two apects I have always had problems with are these: 1) the over-the-top, stereo-typical, portrayal of the Army personnel. and 2) believe it or not, the portrayal of the Sioux. Very down-played version of what the true Sioux and Sioux life was actually like. Neither of these groups were remotely, accurately portrayed in the movie. regardless, still like th emovie. I completely agree with Rock Savage’s “four points”. CBB addresses these with his usual expertise. As much as I fond the “Mad Major” out of place inthe original, I understand why he is needed, even in a small way, to remain – the line, â€œI want to see the frontier before it is goneâ€ is of utmost importance to set the tone for the entire movie. I always liked the “narration” from the original and was somewhat apprehensive of it being edited it out. Once I watched the movie without it, I can’t now believe I ever thought it was necessary. (think “Blade Runner” as a good reference). I never liked the “Stands with a Fist” flashback; always fast-forwarded through; and am very glad it has been excised from the FE. A sign of an effective FE (for me) is as I am watching it and I stop thinking of it as an edit, but as a original movie. I found myself watching this FE initially and trying to spot the edits etc, but as the movie progressed I found myself caught up in the movie. The technical side: the redesigned audio is VERY well done! If there were any flaws in it, then I missed them entirely. the video quality is excellent. never knew how poor quality my standard DVD id compared to the BR version. If you are apprehensive about DL’ing this FE because the original is soooo long, have no fear! This FE trims the original down to a watchable length! Overall, a well paced, excellent FE. CBB never disappoints! While the blu-ray of the long sprawling director’s cut of this film occupies pride of place in my film collection, the slower moments almost seem to cry out for a more tightly-paced alternative version of the film. Boon has skilfully crafted one. The voiceover served its purpose well in the original, and it was not a mistake on the director’s part; yet removing it has allowed viewers to draw more of their own conclusions, follow the main character and become a little more absorbed in the film. Inevitably, when an element designed to be integral to a film is removed, events occasionally sit a little awkwardly with the rest of the film and are sometimes a little hard (but not impossible) to follow for those who do not know the film well – notably the scene depicting buffalo butchered by white hunters and the subsequent night scene at the camp. Nonetheless, the overall result is the creation of a refreshingly different way to experience the film, which is always what I look for in a fanedit. The faneditor obviously had a clear vision of what he wanted to achieve with the edit, and it is implemented consistently right through to the end. Editing: 9 out of 10 for the editing itself. I really liked the way in which the scenes with Spivey and Bauer were trimmed, but the “Mad Major” scene felt a little rushed. I missed the council scene in which the Sioux boys learn of Dunbar’s presence, as they seem to come out of nowhere. One sequence I wish had been cut comes after Dunbar asks to relieve himself; he is bashed on the head, again, and wakes to be interrogated, again. This has always seemed slightly odd, and I would have cut straight to Dunbar washing himself in the stream, as the content of the second interrogation seems to me to be largely implied in the first. Overall: 9 out of 10 CBB’s latest edit is an impressive achievement.